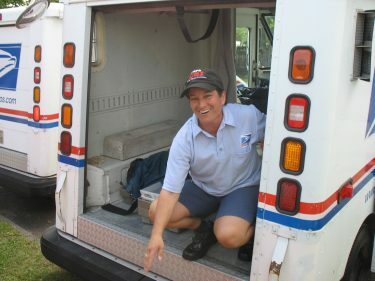 The Post Office Food Drive (POFD) is an annual event held on the second Saturday in May that the National Association of Letter Carriers organizes across the country. Last year the POFD happened on Saturday, May 12. The Northampton Survival Center is the grateful recipient of the food collected in Northampton, Florence, and Leeds. 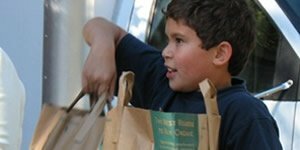 In 2018, the NSC received over 20,000 pounds of food!! If you live in Northampton, Florence, or Leeds, please keep an eye out for your bag that volunteers will deliver to your home in the week before the food drive. Suggested items for donating are canned beans, fruit, vegetable, and soup; tuna; cereal; rice; pasta; powdered milk; spaghetti sauce and canned tomatoes; macaroni and cheese; and peanut butter. Please be mindful of expiration dates. Personal care items such as shampoo, soap, and toothpaste, etc are also welcome. A successful food drive requires many dedicated volunteers. In the week before the drive, dozens of volunteers help distribute bags throughout the Northampton communities. On the day of the event, volunteers help us starting at 10 AM by unloading, sorting, weighing, and stocking food into storage. We schedule volunteers in two-hour shifts throughout the day. Families with older children are welcome to volunteer together. 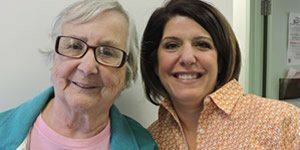 If you are interested in volunteering, please click here to send Diane an email. Thanks to everyone that volunteered last year. Watch this great video by Cheri Cross who captured the 2014 POFD beautifully!